Hey there! We have a giveaway going on! 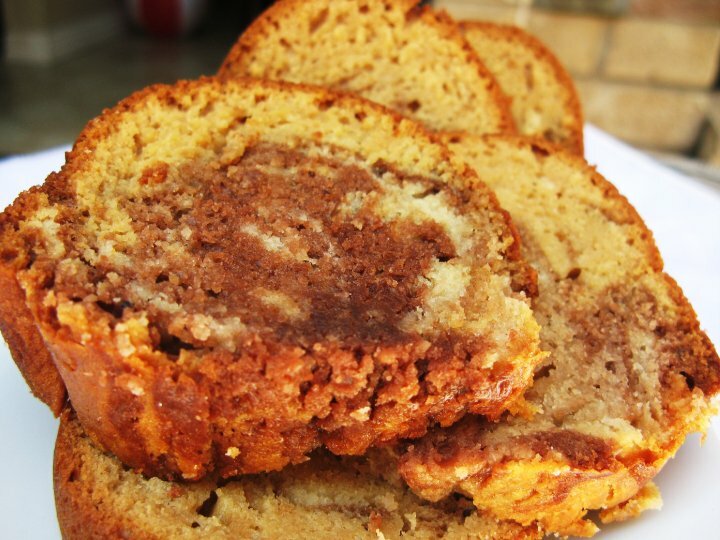 Gorgeous swirls of butterscotch, chocolate and white chocolate in this Butterscotch Chocolate Marble Amish Friendship Bread recipe you’ll love! Thanks to Kitchen Friend May Naing for submitting this recipe. A quick note: I only share links that I love and personally use. This post contains affiliate or commission links which support the Friendship Bread Kitchen if you click or buy. Thank you! Gorgeous swirls of butterscotch, chocolate and white chocolate in this Butterscotch Chocolate Marble Amish Friendship Bread recipe you'll love! Preheat oven to 325° F (165° C). In a large mixing bowl, add ingredients as listed except for the butterscotch pudding mix and Triple Chocolate Amish Friendship Bread batter. Divide the batter in two equal parts in two bowls. Leave one as is and add one box of butterscotch pudding to the other. Pour half the white batter into the pan and top with half the butterscotch batter. Swirl batter together with knife. 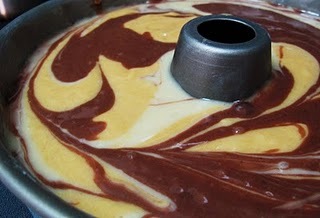 Add the two cups of chocolate batter, rest of the white batter and then the butterscotch batter. Swirl batter again with knife. Bake for 60-80 minutes or until the bread loosens evenly from the sides and a toothpick inserted in the center of the bread comes out clean. >> Have you tried this? Share your best pic with us or leave a comment below and let us know how it worked for you! Love that this uses 3 cups! No need to pass on this week! Looks so good still cooking though…. I made this and it was incredible! I varied it slightly however. I did not do the marble effect; instead I added both flavors of pudding to the same batter and didn’t use the chocolate batter. I stirred 1/2 cup each butterscotch and chocolate chips. Before pouring the batter into the bundt pan I coated the pan in cooking spray and sprinkled a generous amount of cinnamon-sugar in the pan. It was SO good!! Wow, sounds amazing! Snap a picture and send it in next time, I’d love to see how it turned out! Love to make it for the holidays coming up. Jean, you asked where does one get the started. It comes from you. Look in the RECIPES file and look for “Amish Friendship Bread Starter”. This will get you started on these delicious bread recipes. Welcome to the Friendship Bread Kitchen! What started as a great idea for a novel blossomed into a website with over 250 Amish Friendship Bread recipes. Our bestselling cookbooks are now available for your Kindle or as an instant PDF download. Over 200 Amish Friendship Bread recipes, tips and gift-giving ideas! WHAT WILL YOU MAKE WITH YOUR ONE CUP OF STARTER? Don't miss a recipe! Become a newsletter subscriber and you’ll receive a FREE 17-page PDF cookbook plus unlimited access to subscriber-only printables and more. We don't spam, and you can unsubscribe at any time.